Order 4potetials unique report which highlights which companies are the most attractive, have the highest talent-density and are most successful in keeping the talents of Sweden. The report is based on 3000-5000 respondents and approximately 300 Swedish businesses. Only the top ranking businesses are mentioned in the report. In case your business fails to rank or rank at a low level 4potentials founders will send a comment regarding your situation which provides you with a limited situation analysis. The report provides concrete tips how businesses can increase its turnover through activities and decisions on the talent-market. A unique report that provides insight from the talent themselves, why they chose a specific company and what makes them stay. A talented employee that stays an additional 10 days at your business create more revenue for your business than the cost of the report itself. The report is unique on the market as it is able to show extreme correlations between successful recruitments and an increase in profit. How does it do that? Read the report! -HR manager who read the report. 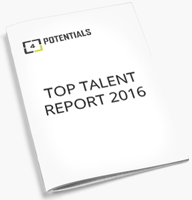 We wish to order 1 copy of the report 4POTENTIALS TOP TALENT REPORT. The cost of the report in PDF format consisting of 25pages is 9000 SEK excluding VAT. It will be emailed to the person who is set as recipient in the fields below. If you are a partner to 4potentials or a lifetime member to 4potentials you received the report to half of its original price. The discount it deducted upon purchase. The PDF will be sent to you no later than 2 days after ordering. The report is updated on a monthly basis which may cause the results to differ depending upon the month of purchase.